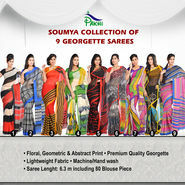 A saree brings out the best in females, no matter what size or age you are. It's one of the most versatile apparel of the Indian culture. From weddings to cocktails, formal events to casual day out, this traditional attire can be worn for various purposes at various events. It makes you stand out from the crowd, giving a new dimension to your overall personality. As fashion keeps on changing by each passing day, how can sarees be left behind? Today. there are more variations available than ever before. They beautifully blend the modern trends with sophistication of tradition and are simply a great outfit for any occasion. 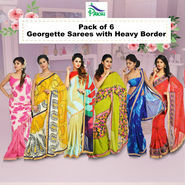 Figure flattering and attractive, designer sarees are ultimate attires for fashionable you wherever they are worn. The changing trend has redefined the look of these ethnic wear as today you will find them in a different sort of fabrics, design and embellishments, Cotton, georgette, silk, crape, chiffon, tusser silk, etc. are some of the popular frabics to choose from. There are even more. You can choose the fabric as per your desire or according to the weather. Cotton fabrics are considered best for summer while Silk ones can be worn during winter. 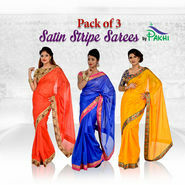 Thus, browse through Naaptol.com and find a complete range of versatile sarees at discounted price. Naaptol feels immense pleasure to bring to you an enormous collection of this gorgeous traditional attire. This exclusive range helps you steal the limelight of every formal and casual event. This traditional outfit can also be worn in diverse styles representing different cultures and tradition. Acclaimed brands like FNF, Apno Rajasthan, Diva, Rajrang, Sanskriti, etc. are masters in this section offering a range of designer traditional wear in beautiful colors and exquisite embellishments. The sequins and glitters add extra charm that catch and reflect light stupendously.